Sandro Galea stood in School of Medicine’s Hiebert Lounge and told an audience that as students, they can utilize science to create a healthier world. The forum centered around violence and reframed gun violence as a public health problem rather than a criminal justice issue. 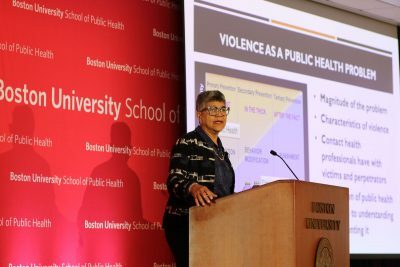 Months after the nationwide “March for Our Lives” protest and movement to enforce tighter gun control, Boston University’s School of Public Health and School of Social Work joined together to host the forum titled “Violence Prevention: Guns, Public Health, and Health Care” Tuesday. The forum was part of SPH’s series of Dean’s Signature Programs, an annual collection of more than 30 events that encourage conversations among students, scholars, health practitioners and policymakers. The talk addressed gun-related violence prevention. Deborah Prothrow-Stith, dean of Charles R. Drew University of Medicine and Science’s College of Medicine and former commissioner of public health for Massachusetts, led the forum. After obtaining a doctorate from Harvard Medical School, she said she realized that her education did not address violence. For over 30 years, Prothrow-Stith has worked to define violence as a preventable public health issue rather than solely a criminal justice matter. During the forum, she explained that there are three main stages of violence prevention: education, behavior modification and punishment. According to her, primary prevention falls under the responsibility of public health, criminal justice controls the tertiary phase, and the two work together to guide the secondary stage. Risk factors of violence include gender, poverty, access to guns, alcohol and drug use and previous exposure to violence, according to Prothrow-Stith, and most homicides involve two people who know each other. Race plays a major role in gun violence, as most firearm-related deaths among white males are suicidal, whereas black males tend to use guns for homicide, according to CNN. Prothrow-Stith explained that people of color are also disproportionately affected by police brutality. According to a 2010 study published in the American Journal of Medicine, Americans are 10 times more likely to be killed by guns than people in other developed countries, and the United States has the most firearms per capita in the world. When discussing prevention techniques, she compared violence to more commonly recognized health issues. According to her, violence prevention can be implemented in schools through classroom education and training authority figures how to effectively respond to bullying. Programs such as Big Brothers Big Sisters also provide guidance for youths from under-resourced families, particularly in urban areas. In homes, guns can be stored and locked separately from bullets. Media campaigns can help shift social norms, and public policy changes can limit the accessibility of firearms, according to Prothrow-Stith. One preventative public policy effort was seen in 1994 when then-President Bill Clinton signed the Public Safety and Recreational Firearms Use Protection Act, which prohibited the manufacture of large-capacity magazines and semi-automatic firearms for civilian use. However, this bill was designed to expire after 10 years, and in 2004, Congress did not renew the legislation, according to Prothrow-Stith. Many of today’s youths have shown increased support for stricter gun control, she said, as demonstrated in the “March for Our Lives” earlier this year. Ivy Fan, a freshman studying marketing in the Questrom School of Business, expressed a need for tighter gun control because “words and prayers will not breathe life back into the dead. Some good things here. I especially like the teaching part of violence prevention which may need therapy added to it. But if you read the FBI research and the research from Dr. John Lott, you will discover the firearms in the hands of law biding citizens actually save several hundred thousand lives more than are lost by the hands of the criminal element. Gun safety is necessary but gun control makes the public victims and the criminals know this. Great points, with public health being a factor in controlling violence with guns. Providing adequate mental health services to those who are struggling with depression and anger issues is crucial.